Dating back to the Yuan dynasty (1279-1368), Jingshan (which means “scenic mountain,” and is referred to as Coal Hill) was transformed into an imperial garden annex of the Forbidden City during the Ming dynasty (circa 1420). It contains five peaks highlighted by the eponymous artificial hill created using soil dug out from the moats around the Imperial Palace. In fengshui tradition, residing to the south of a hill is auspicious, thus Jingshan (also known as Fengshui Hill) was built to the south of the Imperial Palace. Picturesque Wanchun Pavilion is situated on the very top peak and offers truly spectacular views of the Forbidden City complex. during the Republican period, it was first open to public and officially designated as a park in 1949. Today, it is filled with young and old who come to chat, stroll, sing, dance and fly kites in one of the city’s last remaining bastions of lao Beijing culture. Enter through the Enter through the East Gate of Jingshan Park (1) and you will see a garden full of peonies on your right. Keep left and walk on gray slate paths among green grass until you reach a path that branches into two sections. The path to the right is a bit steeper, while the path to the left is a longer, less strenuous walk. Also, railings on both sides make it more suitable for older visitors and young children. and you will see a garden full of peonies on your right. Keep left and walk on gray slate paths among green grass until you reach a path that branches into two sections. The path to the right is a bit steeper, while the path to the left is a longer, less strenuous walk. Also, railings on both sides make it more suitable for older visitors and young children. No matter which path you choose, climbing to the top is well-worth the effort. Even amidst the smog, you can take in views of the entire Forbidden City complex along with Beihai Park, with its many boats appearing as silvery specks atop the water. This is one of the best photo opportunities in the city. Wanchun Pavilion (which doubles as a temple) is also located at the top of the hill, along with Jifeng, Pulan, Guanmiao and Zhoushang pavilions which are scattered along the lower peaks. Take the nearest path down to the West Gate where you will find an outdoor café specializing in juices and coffee. A walk back to the East Gate from the South Gate will take you past Waibo Shu, or the Slanted Neck Tree – named after the spot where the Chongzhen emperor took his life. Today, there are two plaques commemorating his death beside the tree: a macabre memorial set in otherwise serene surroundings. Exit the East Gate, cross the street and walk right to the Alley Café (2), which sits to the left of the entrance of Shatan Houjie. With its traditional Chinese style exterior and graffiti inspired interior, Alley Café serves Western and Chinese food. They also provide bike rentals for RMB 50 per hour (RMB 600 deposit). After a quick snack at the café, head on out of Shatan Houjie and turn left, walk straight and you’ll see Old Beijing Cloth Shoe Store (3) to your left. This small shop offers decent quality shoes for sale. Prices are negotiable and shoes come in an array of colors and designs. Continue walking down Shatan Houjie until you reach Jingshan Dongjie. Turn left as the street comes to an end and keep walking until you reach Wusi Dajie. This street was named after China’s May Fourth Movement of the early 20th century. Previously filled with hutongs and timeworn shops, it is now home of the National Art Museum of China (6). Regular exhibitions are held inside its refreshingly cool confines. Walk across the street to the intersection of Wusi Dajie and Beichizi. On the corner is Lao Beijing Zhajiang Noodles (4) (老北京炸酱面) – a restaurant that serves passable Beijing-style noodles for around RMB 20 a bowl. Other house specialties include ludagun, a dessert made from green bean for RMB 25 a serving. The restaurant is nicely air-conditioned and has seating on two floors. From the noodle shop, make a right and continue down Wusi Dajie past the intersection of Beiheyan Dajie until you reach Honglou (5), which appears on the left side of the street. 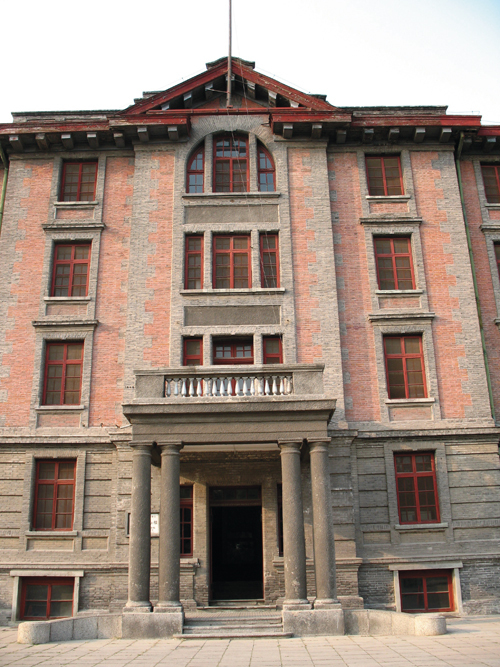 With its huge letters in the front commemorating the 90th anniversary of the founding of China’s Communist Party, this iconic red Western-style building was once home to the Peking University library where party founders Li Dazhao and a young Mao Zedong worked as librarians and administrators. Classrooms inside exhibit publications that date back to the early years of the Communist Party. Displays come with English descriptions. Admission and the clean bathrooms within are free of cost. Up the street from Honglou and across from the National Art Museum of China is the Gehua Beihua Art Supply Store (6), which sells a variety of art supplies for budding artists. Paintbrushes in a variety of qualities run from RMB 9 to 50. Sharpie pens cost only RMB 5 and good-quality gel pens are RMB 9 each. The store also offers canvases and other more sophisticated supplies for more serious young artists. After a day of culture and art, take your budding artists home.